Dates: September 29, 30 and October 1, 2017. We (Mike, Dan and Myself) started planning #KatyTrail2017 back in January. Initially we planned to do the ride in May, but we were unable to get a date that worked for those who were interested, so we planned the ride for the end of September. Originally we planned to have someone drop us off and we would bike pack the entire trip. The goal for the year was that we would train throughout the year, riding on the Katy, getting distance in, and hopefully take a practice ride over a two day period where we would ride somewhere for the night with all our gear, camp, and return back to our starting point the next morning. The training occurred, but the trial overnight trip never happened. A few days before the trip my father and mother arrived in Missouri, completing their drive/move from Arizona, with their RV. We talked my father into driving us to our starting point (more on that below), hauling our gear, and then meeting us each night at our designated stops! It worked out great! Start Clinton, Missouri, lunch in Sedalia Missouri, stay the night at the Katy Roundhouse in New Franklin, Missouri. Start from the Katy Roundhouse, lunch in Hartsburg, Missouri, stay the night in Marthasville, Missouri. Start in Marthasville, Missouri, lunch in St. Charles, Missouri, reach eastern terminus in Machens, Missouri and return to St. Charles, Missouri for pickup. Overall we stuck to that plan, with two major (minor?) changes. We hit Hartsburg around 10am, way too early for lunch, we ended up having lunch in Mokane, Missouri. On Day 3 when we arrived in St. Charles, there was a Marathon going on, so we skipped having lunch there in favor of finishing in Machens and getting picked up near the end of the trail. Getting ready for the trip I made a list of things to bring (List of Items for Katy Trail Bicycle Ride). On Wednesday before the trip I made sure to get some grocery shopping done. Because we were going to have RV support, we decided that we wouldn’t be buying breakfast or dinner each day, instead we would make those meals. This meant we only needed to plan to purchase lunch, and any snacks on the way that we didn’t want to carry with us. We ultimately only purchased lunch 2 days, and didn’t purchase any snacks along the ride, eating what we carried with us. In addition to food for meals, I purchased a box of Honey Stinger Vanilla Waffles, some Honey Stinger Gel, and Honey Stinger Fruit Chews, to haul along with me on the ride. I was going to be sleeping in a tent that my brother had loaned me, so I made sure to know how to set it up before we headed out. I highly recommend you do that yourself before a trip! I also ordered a “self-inflating” sleeping pad, and learned that self-inflating was a pipe dream, though manual inflation was pretty easy to do. To get started for the trip, we headed out of Wildwood, Missouri around 4pm on Thursday the 28th. We decided to take off on Thursday, drive to Marshall Junction RV Park in order to cut the drive down a bit on Friday morning. This was planned to give us more time to ride and hopefully more sleep the night before the ride, instead of getting up at 3am and heading out. We arrived at the RV Park after dark on Thursday evening and setup camp. Mike was planning on sleeping in a Hammock for the trip, but the Marshall Junction site didn’t have a great place to setup the hammock, he slept in the RV for the night. Dan and I ended up sleeping outside, myself in my tent, and Dan in a bivy sack. Friday morning we got up early, had oatmeal or pop-tarts for breakfast and loaded up in the RV and headed south through Sedalia, towards Clinton. We arrived in Clinton, got organized, and managed to get on the trail around 9:10am. We rode from Clinton to Sedalia at a pretty good clip. 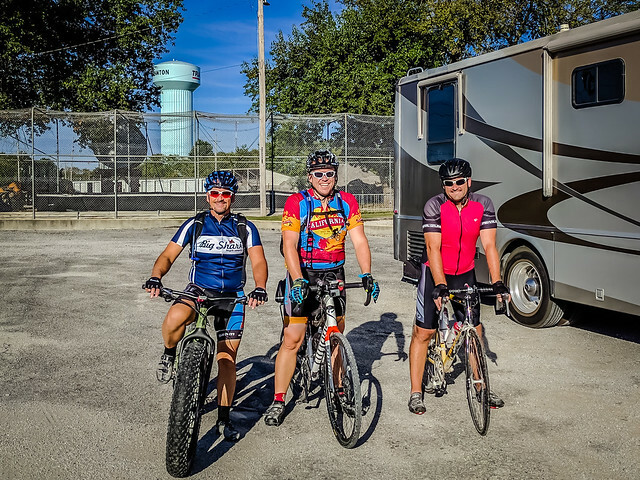 We had fresh legs (somewhat, considering I had done Pedal The Cause 5 days earlier), but we were a little shocked to find that the Katy Trail in the western half of the state is not near as flat as it is in the eastern half of the state. For the day, 78 miles, we ended up doing 1500’ of ascent, not a large number, but definitely a lot larger than we expected based on our riding of the Katy Trail out east. Before lunch we passed the high point (see photo) of The Katy Trail. We made it to Sedalia just before noon. We crossed the bridge over Highway 65, and headed off trail, north, through a field that dumped us onto a neighborhood street. We rode to the local Dairy Queen for lunch, filling up on food for the day. After lunch we hopped back on the trail and continued our way east through Sedalia. Just before the caboose in Sedalia, we came across a box, that had a sign that said “Baby Rattlers” with a picture of a rattlesnake on it. As we went by, Mike and I wondered if they could be real, I joked and said I bet lunch (Saturday) that they are baby rattles, and not rattlesnakes. So we headed back to check. Needless to say, Mike picked up the tab for lunch on Saturday. 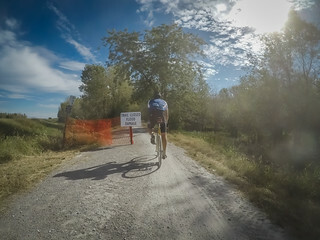 In Sedalia there is a section of the Katy Trail, from Griesson Road to Boonville Road that is closed. The detour on side streets is clearly marked (painted Katy Trail logos and arrows on the streets). It appears that this section of the trail has been out of commission since November 14, 2016, with no foreseeable end in sight, according to the Missouri State Parks site. Outside of Sedalia we started seeing what looked like CD-Rom sleeves attached to the mile markers, we probably saw them for 20 or 30 miles. At one point, Mike stopped to grab one, but after picking it off the mile marker, it didn’t have any labels/branding, but did appear to have data on the disk. He reattached it back to the marker. Shortly after that, I believe in Pilot Grove, we found another one attached to a bulletin board, I went ahead and grabbed the disk. A week after the ride I finally put the disk into a computer, it ended up being a DVD-ROM disk, and had some religious propaganda on it, looks like it is a film called Heaven: Our Eternal Home by Questar. I won’t dignify the film with a link, but if you’re interested you can find it on Amazon. I’ll be honest, I really had hoped it would be something cool, maybe a puzzle/game, a mix tape, or something else, but religious propaganda, snooze. Also at the Pilot Grove stop there were some painted rocks, labeled “Sedalia Rocks!”, I wish I had picked two of those up for my kids instead of that DVD. The rest of Day One was fairly uneventful, though if you’re coming into Boonville from the west on the Katy Trail, be sure to watch the signage closely. I missed an arrow on the street and ended up at the old rail bridge, which is out of service, trying to cross the river. Ended up having to swing easterly around the casino and cross over the river using the bridge that vehicular traffic uses. We ended up at the Katy Roundhouse after crossing over the bridge and around a little bit of construction traffic, to get setup for the night. Camping at the Katy Roundhouse was easy, my father was already there in his RV, setup. After arriving I took a seat for about 20 minutes before getting up and starting to get the tent setup for the night. Showers and restrooms are available if you’re camping (paying) at the Katy Roundhouse, there is also power outlets on the shower building if you need to recharge devices. For dinner we ended up cooking hotdogs and two boxes of mac and cheese. I think I was in my tent by 8pm, and asleep before 8:45 after turning my phone off. We started off day 2 off with breakfast (eggs), and hit the trail at 7:15am, making great time to McBaine, Missouri. We made it to the Burr Oak Tree, which is one of the oldest trees in the State of Missouri. If you’re able to, check this tree out. It isn’t far off the Katy Trail, make a right (south) on Burr Oak Road. From McBaine we rode on to Hartsburg, which was originally our planned lunch stop. We arrived there just around 10am, and decided it was too early for lunch. We did get some great snacks though, the DAR (Daughters of the American Revolution) were hosting a Wheeled Warriors bicycle ride on the Katy Trail for the day, they supplied us with Gatorade, bananas, candy and granola bars for our efforts. From Hartsburg we headed further east, making our way over towards Jefferson City, there was another DAR station at the North Jefferson stop on the Katy Trail. We continued through the stop, but ended up stopping on the trail about a mile later. My legs were finally starting to feel extremely tired, so I grabbed a bench for a short break and snack. Mike and Dan stopped with me, I was feeling pretty frustrated at this point, and told them to head on without me, I felt like I was holding them back (I was). Fortunately for me they stuck with me and made sure I finished the day. Shortly after the bench stop, I realized that my rear tire was low, so we stopped and pumped the tire up. My hand pump didn’t appear to work, so thankfully Dan had a hand pump that worked much better. We ended up fighting the leaking tire for the next couple of hours, hoping to find a floor pump at one of the stops along the way, but being unable to do so I ended up throwing a tube in the tire (it was setup for tubeless). Once were were able to get the tube in, the rear tire held air well the rest of the trip. Throughout the day we passed, and then were passed by, a couple of gentlemen from the St. Louis area. They had taken the train to Lee’s Summit, and took the Rock Island Spur from Pleasant Hill to Windsor where it joins the Katy Trail. I believe they stayed in Hartsburg (maybe it was somewhere else) for their second night. We swapped trail positions with them off and on throughout Saturday, primarily due to my tired legs and leaky tire. We were keeping a faster pace as they were loaded down with all their gear, but due to my frequent stops they kept catching up with us. We had the opportunity to chat with them a bit, at one stop they asked if I was Chris Hammond, and if I know Dave Whitworth, it’s funny where you run into former autocrossers. We ended up having lunch in Mokane Bar & Grill there in Mokane, Missouri. I will tell you, there isn’t much to Mokane. The Bar And Grill serves a cheap meal, with plenty of tater tots, and cold drinks! If you’re looking for a place to stop, you can stop by there. We ended up not locking the bikes up, I left the chain in the RV on Day 2, no problems at the B&G. We had hoped to fill my leaky tubeless tire in Mokane, but the stop there didn’t have a bicycle pump, so we just used the hand pump and rode on hoping to get to the next stop with some tools. We continued on for the ride and passed through Portland, Bluffton, Rhineland, McKittrick and then Hermann. By this point my legs were really struggling, but Mike stayed right there in front of me and pulled me through the wind. Did I mention that we had a headwind for Days 2 and 3? Day 1 we had the wind at our backs, but not the other two days. Having Mike there sure helped, I know it wasn’t fun for him to pull me the whole way, but it sure helped me finish. At the end of Day 2 we pulled into Marthasville. We weren’t quite sure where to go, there were ball fields south of the trail, but I thought there might be a park up north of the trail that we were supposed to camp at. Luckily I saw that my dad was parked at the Marthasville Community Club park, which is the ball fields south of the trail, he had the RV plugged in (110v) and we settled down there for the night. Mike actually went on for another few miles, needing another 3 miles to reach his lifetime milestone for distance in one ride. I ended up meeting mine with 112 miles on Day 2. Next time, unless I’m going for a KT record, I think we’ll cut day 2 a little shorter. The park in Marthasville has hot showers, a restroom and access to a bar and grill, as well as a convenience store not far away. About an hour before we finished the ride I remembered I hadn’t taken the hamburger meat out of the freezer in the RV that morning, so we weren’t going to be eating hamburgers. We ended up having hotdogs and mac and cheese again for Saturday night dinner. In addition we also broke out the bag of Fritos. After my rough day on the bike, I decided I was going to spend my last night sleeping in the RV instead of my tent. I ended up freezing in the RV, should of taken my sleeping bag in there with me! I may have actually slept better the night before in the tent. 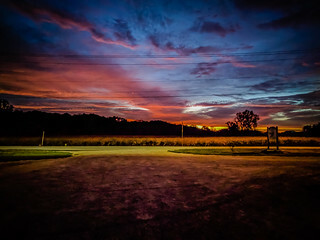 The third day started with Pop-Tarts for everyone (brown sugar cinnamon, warmed up in the toaster of course) and a beautiful sunrise in Marthasville. We weren’t quite sure where we were going to finish our ride. 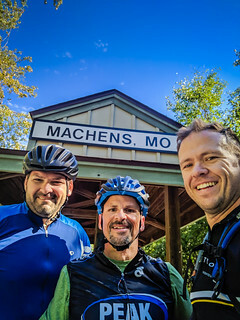 Originally we planned to stop in St. Charles for lunch, ride to Machens at the end, and then return to St. Charles to get picked up. We had heard that the trail might be closed before Machens, and verified that via the Missouri State parks website. This left us with either 40, 52, or 64 miles depending on how far we went and how far back we came to get picked up. 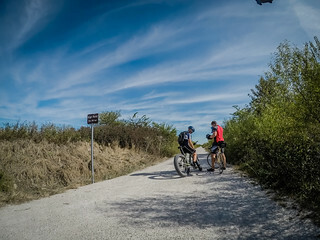 After riding for two days, we decided we were going to skip lunch and try to have my father pick us up somewhere near where highway 370 crosses the Katy Trail. After our healthy breakfast, we quickly hit the trail with the intention of trying to get to St. Charles in 3 hours, and finish our ride before noon so that we could head off to various kids sports games that were scheduled on Sunday afternoon. We made great time, reaching Defiance before taking our first break. From there we rode to the Page Extension where we were going to take a break. It turned into a short break because we saw a sign for the Big River Running company, and after inquiring, were told that there was a marathon taking place. The leaders from the marathon were coming down on the trail as we took our break, so we cut it short to try to get back out in front of them as to avoid traffic. Well, traffic was not avoided. We ended up running into the pack of runners coming the other direction on the Katy Trail out of St. Charles. The biggest congestion points were the feed/water stations for the runners, with volunteers there not paying attention to any trail traffic coming from the opposite direction. The marathon, and shorter distances, were finishing right in downtown St. Charles, on the Katy Trail, which created a huge mess. We ended up getting off our bikes and walking in the thick of it. Once we made it through the masses in St. Charles we hopped back on the bikes hoping to ride to Machens. True to the messaging posted on the state park website, between Mile Marker 35 and 34, the trail was in-fact marked as closed, but the orange fencing didn’t cover the entire trail, so we decided to ride on until we reached a point that was impassable. On this section of trail, we reached the lowest point of the Katy Trail. You could tell that there had been flooding there, but I honestly don’t know why the trail would be marked as closed in this section. It was very passable and safe, we saw multiple people along this section of the trail as well. From there it was a race to the end of the trail in Machens. Okay, we didn’t race except for the last 1/4 mile or so, I was still too tired to push too hard until the very end. We reached the eastern terminus and celebrated. We actually sat there for a few minutes, soaking in all the glory of completing the 240 some odd miles of our adventure. From there we called my dad to see where he was parked, and organize how we were going to get picked up. We had absolutely zero motivation to ride back towards St. Charles, so I pulled out Google Maps to locate the nearest road we could ride to in hopes of finding somewhere that dad could get the RV pulled off and bikes loaded up. We managed to get up off of Highway 94, and Dad picked us up there for the ride back to my house in Wildwood. Here’s a group shot from the finish. 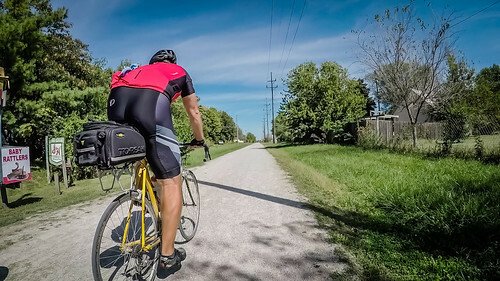 If you are planning on riding the Katy Trail as your first multi-day bike trip, it is a great trail for that. Here are some of the things I learned on my first bike trip. Wear chamois cream, you might not want to, but trust me. I didn’t the first half of the first day and paid the price with some chaffing the remaining two days. Fortunately I was only chaffed a bit, and not too sore on the seat the whole way. I definitely do not recommend trying to do it completely self supported in 3 days. If we had been carrying all of our gear, there is no way we would have made the time that we were able to make. My legs definitely would have stopped working if I had the bike loaded down with another 10-20lbs of gear (guessing at weight here). 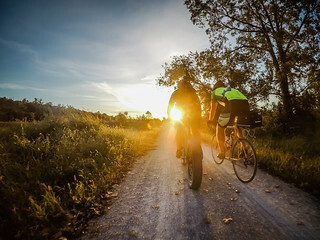 If you’ve got someone supporting you, carrying most of your gear, the ride is definitely doable in 3 days. We probably could have saved 20 or 30 miles from Day 2, and completed the distance on Day 3 instead, saving some of the extra effort of doing 112 miles that day. If I were to change anything, I simply would have taken my Camelbak and some food, I didn’t need a rear bag, or frame bag for this trip supported. Another thing I wish we had done was taken more time to enjoy the views, the stops, the friends. We were pushing it pretty hard for 3 days, and while it was a great ride and great effort, we didn’t get near as much time as I think we all would have liked to stop and smell the roses a bit more. If you’re considering riding the Katy Trail, definitely get out and ride the Katy a lot before hand. Get to know the surface. It is an interesting surface, a crushed limestone I believe. The trail is pretty darn flat (at least most of it) so you will not have many hills to climb, or descents to bomb. You will be pedaling, a LOT. The trail slows you down if you stop pedaling, so get those legs used to turning over and over and over again, for hours at a time! Be sure to plan out your stops for where water and services will be available. After riding the Katy many hundreds of miles on the eastern side, we expected every stop to be like Augusta or Marthasville, and they most definitely are not. Some stops have bathrooms, some have water, some have both. Some stops even have bike tools, but it’s pretty much guaranteed the stop where you need the bike tools won’t have them. What comes next for riding? Well, I’ve taken a week off, and due to travel this week, will not likely be on a bike again until this coming weekend. I’m hoping to get out on the Niner Air this weekend and get started on mountain biking. At some point, maybe next year, I’ll plan another big bike trip. While riding the Katy we tossed around the idea of RAGBRAI, so, maybe we’ll look into that. It is time to dole out the thank yous for this ride. First, to my father Bill Hammond, from myself, Mike and Dan, thank you for supporting us on the ride! Without you getting us there, meeting us each night, and hauling our gear, the ride would have been a lot more difficult! Second and Third, to Dan and Mike, thank you for joining me on this adventure. It was a great year of riding getting trained up for the ride. Without you guys I wouldn’t have finished, thanks for putting up with me. To my wife, thank you for allowing me to do this! Next time you are doing it to like we originally planned! To my mother, thank you for watching the kids while I was off riding bicycles and Natalie was off playing Crossfit for the weekend.